Over the last 9 years, I have been involved in youth participation platforms at various levels of responsibility and influence. From serving in my home city’s Junior Council in 2007 to setting up and supporting youth networks in Africa over the last 5 years, and representing adolescents and youth in the PMNCH’s Executive Committee for a time in 2016. Indeed a lot has been learnt from all this, but certainly not enough to have me step back as yet. There’s one more hurdle to jump as I work now to research on and inform our global health space on how to better support the growth of a sustainable movement for youth engagement. I must say, now is a good time to be young, particularly because our governments are finally coming to terms with the fact that adolescents and youth need to be recognized and supported differently to the overall population. They are moving away from painting us all with the patronizing brush of ‘children’, and to leaving us to our own means until we reach adulthood. This progress is directly reflected in recent developments in the global health space, especially with the new focus on adolescents in the new Global Strategy on Women’s, Children’s and Adolescents’ Health and the creation of the first-ever Adolescents and Youth Constituency in the Partnership for Maternal and Newborn Child. The last few years have also seen an increased number of young leaders appointed to serve on Boards, and other high-level governance and advisory groups in the health space. In appreciation of this, I commend for-profits, non-profits, foundations, governments and UN agencies for taking bold steps towards meaningful youth engagement in opening up their decision making spaces and providing support to young leaders across the globe. I have been involved in some of these platforms and have seen first-hand, the value of allowing youth to have seats at the decision making table, and to have our views respected and acted on. These are good changes, and I hope more organizations will take this up. It is such progress that makes me optimistic about our ability to deliver on the tenets of the new Global Strategy, particularly around adolescent health and development. They resonate with the strategy’s call for investments in young people and adopting youth-friendly policies to yield demographic dividends for countries in transition. Indeed it is through supporting the leadership of adolescents and young people that we can learn how to prevent over a million annual adolescent deaths, in decisively addressing early pregnancy, road injuries, HIV, suicide and other drivers of adolescent mortality. Young people can bridge the gap between strategy and practice, in reducing non-communicable diseases in adulthood through encouraging physical activity in adolescence; leading advocacy and community mobilization to end all forms of violence against women and girls; and increasing support for young people’s mental health. In spite of this optimism, I still don’t think we are doing enough to support the transformative power of meaningful youth engagement. In many circles I still see youth tokenism at play, with young leaders roped in to simply fill quotas and adolescents invited to dress development events with a measure of respectability. This continues to happen in spaces and organizations that want to appear to be supportive of youth engagement, but are not willing to invest time, research and financial resources into understanding what young people expect their engagement to look like. I still see territorialism, especially in the global health space as agency after agency competes for funding and recognition of their adolescent and youth engagement programs. I have seen the same competition in non-profits, and a similar strain in for-profits and foundations in their quest to prove that they are the best in the ‘youth engagement business’. Different institutions still maintain a blind loyalty to their programs and brands, without opening up to learning, experience sharing and the kind of integration that will accelerate action towards adolescent and youth health. Sadly, in many programs and youth engagement efforts, young people are still exploited and undervalued. Somehow we have been content to pay for a young person to speak to us and contribute to our decision-making processes, without investing in their development as an individual. This continues to happen even though we have spoken clearly in our strategies about the life-course approach to health, and the interwoven dynamics of a young person’s life. I have met young leaders without money to pay for a semester of school, but speaking to a gathering of Heads of State; I have known young social entrepreneurs that have had to survive on travel allowances to support their organizations and their own well-being, though they sit on decision making platforms with multi-million dollar foundations and organizations. I have been that young person at many points, and I’m pained to see the same cycles recurring as young leaders devote the most important years of their lives to a system that has the means to support them but chooses to give nothing in return. With these flaws in mind, it is worth a reminder that its this system of global health governance that has continued to produce over a million annual adolescent fatalities and has subjected the world to inequality, violence and grave risk to disease. A change in results will require a change in mindsets and a deliberate redistribution of power to those whom it is actually created to benefit – particularly to young people. To do this, we need a conscious shift in where we locate future investments for youth participation, from support to high-level engagement to empowering community level actions. We already have the SDGs; we have a new Global Strategy and 177 health-related commitments from governments, donors, civil society and the private sector (as at June 2016). Perhaps our greatest investment in resources shouldn’t go to global and regional level consensus building – we need to give resources to youth movements in country instead. Its messier, requires a lot more work and diligence, but this is where change will happen. 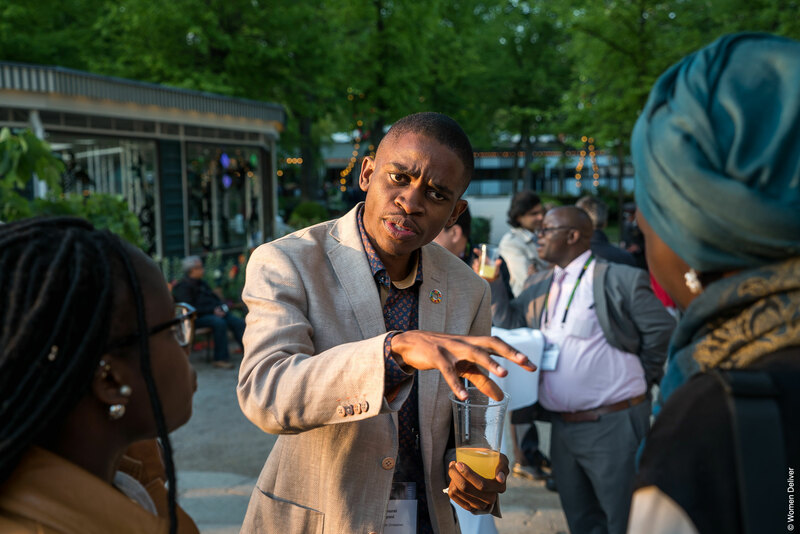 There is a general sense of fatigue from the intense global advocacy youth work that helped inform the SDGs, and had us mobilize diverse voices to speak to different issues. We have made our calls to action, now we need to act on our calls, albeit with a measure of remaining support to sustain high level political commitment to youth engagement. I’m still mindful of the need to keep advancing our agenda until we get what we need. There is still a strong pushback to youth demands, because individuals in power have yet to see the necessity of changing the way we approach youth development and youth participation. For years we have demanded a stand-alone UN Agency on Youth, but we got a Special Envoy instead; it is progress but we need to push more. Throughout the negotiation of the new SDGs, we demanded a stand-alone Youth Goal, but we got youth targets instead; we still need to push more. It’s not enough to just establish an office on youth or a commission, or to minimize significant youth needs into a subset of politically correct targets; youth are a massive demographic, caught at intersections of inequality, disease, disempowerment and exclusion, and we are the only population group with a transitional identity. We need lasting structures to support a generation on the move, and so I still call for a stand-alone Agency on Youth and a clearly defined and resourced Global Sustainable Development Agenda on Youth. We need to invest in research, especially that which is led by youth activists and academics themselves. I believe that each generation asks different questions of power, based on the impact of decisions on their daily lives. We have our own research questions as today’s generation of youth and we need support to find the answers. We need to find out how much has been spent on youth engagement work in the last 5 years, and the results of this in changing the lives of young people within these spaces, as well as in communities in which young leaders serve. This will help to identify clear pathways between supporting a young leader and bringing change on the ground. We need to measure the cost of exclusion of young people in parliaments and other decision-making spaces, and make projections for the value of their inclusion. We also need to measure the financial value of young people’s contribution to development work over the years as volunteers and social entrepreneurs, and how best to increase investments in the youth sector. Lastly, we need greater convergence of the work of various youth programs at global level. This will require the commitment of donor agencies, governments, foundations and for-profits to collaborate in pursuit of common results. When a health service reaches an adolescent, the channel through which it comes matters little. Perhaps we should tone down our celebration of individual solutions and to stop rewarding harmful competition, in an effort to stop organizations from the urge to ring their own bell. Why can’t we celebrate collaboration instead, at least for a time, to help build a culture of integration and counter individualism? I believe its worth a try. For now we have a new Global Strategy within its second year, and we have until 2030 to do justice to the participatory and development needs of adolescents and youth. I will be working in different capacities to support a more united adolescents and youth movement in support of the strategy, under a collective banner that might be called #EWECYouth. If you’re thinking of a practical next step from this post, I encourage you to ask young people within and around your organization about their needs and find a way to support them as an institution. If there isn’t a way then commit to making a way, remember, we have a world to change.